A 17-year-old girl has become the latest murder victim in London after she was stabbed near a children’s playground in a park in an apparent random attack. The student, named locally as Jodie Chesney, was said to have been “just sitting” with friends in the park in Harold Hill, Romford, on Friday when she was approached by two men. It is understood one of the men was seen to stab her in the back before the pair fled. Neighbours and parents of those she was with rushed to her aid. Teresa Farenden, a 49-year-old mother of three whose home backs onto Harold Wood where the girl was attacked, went to help the teenager after hearing screaming coming from the park shortly after 9pm. Explaining how she had heard voices yelling for help, she said: “I never thought in a million years that I would be walking out to a young lady who had been stabbed. “Then a boy said, ‘I need help, my girlfriend has been stabbed’ and I just flew over there. She placed the girl in the recovery position and administered chest compression in the hope of reviving her. “The knife’s blade was still in her, but I didn’t see it because it was dark,” she continued. An ambulance crew arrived, but Ms Farenden believed the girl was already dead by then. The girl is the 18th person to be murdered in London this year, five of whom have been teenagers. She was also the fifth person to be fatally stabbed in the capital in just eight days. Her family said they were too distressed to speak. Friends who congregated at the scene tearfully told how the girl was studying psychology and sociology for her A-Levels. She apparently attended Havering Sixth Form College. The students, who lay flowers near the site where she was attacked, said she was not the type of girl to get into any trouble and was “the nicest girl possible”. 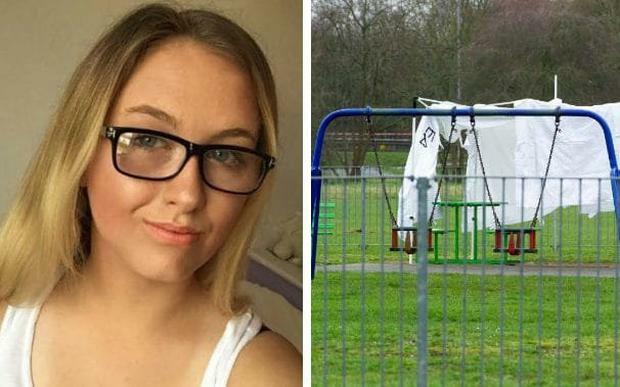 A mother who had accompanied her son – a friend of the girl’s – to the scene, said Jodie was with three friends in the park when the attackers struck. “Two of them chased the scumbags and two of them were trying to get help,” the woman, who did not want to be named, said. “I believe it was a random attack. They were just sitting there, they were having a Friday night giggle, as we have all done. “What do you do at 17? You just want to go out and be with your mates and not have your mum tell you to stop making so much noise. Forensic officers conducted a fingertip search of the area, just yards from a children’s playground. A Scotland Yard spokesman said a murder investigation had been launched and the victim’s next of kin had been informed. No one has been arrested. Acting Detective Chief Superintendent John Ross of the Metropolitan Police’s East Area Command Unit described the girl’s death as a “tragedy”. He issued an appeal for witnesses to the attack or anything suspicious in the area on Friday night. The officer added that additional patrols would be put in place in the Harold Hill area.